You can also perform a more selective search for churches in the Kirkstead area or see them printed on a map. The Cistercian abbey was founded here in 1139 and dedicated to Saint Mary. The original abbot and twelve monks were from Fountains Abbey in Yorkshire. It appears the small, ancient Anglican church or chapel was built for the villagers by the monks of the Abbey in the 13th Century, since only the monks were allowed at services in the Abbey. It now stands near the Abbey ruins. The church here was originally a thatched-roof stone building, but the roof was converted to slate in 1790, and the bell, which had hung in a tree, was placed over the west end of the building. The present Anglican parish church is dedicated to Saint Leonard. The Anglican church building fell into disuse and was taken over by Daniel DISNEY as a Presbyterian chapel from 1730 until 1812, when a new Anglican minister was assigned. The church was repaired in 1843 and again in 1846. The church was restored in 1914. The church only seats 100. Visit the Church of St. Leonard's Without page at Churchmouse for a little history and some photographs. 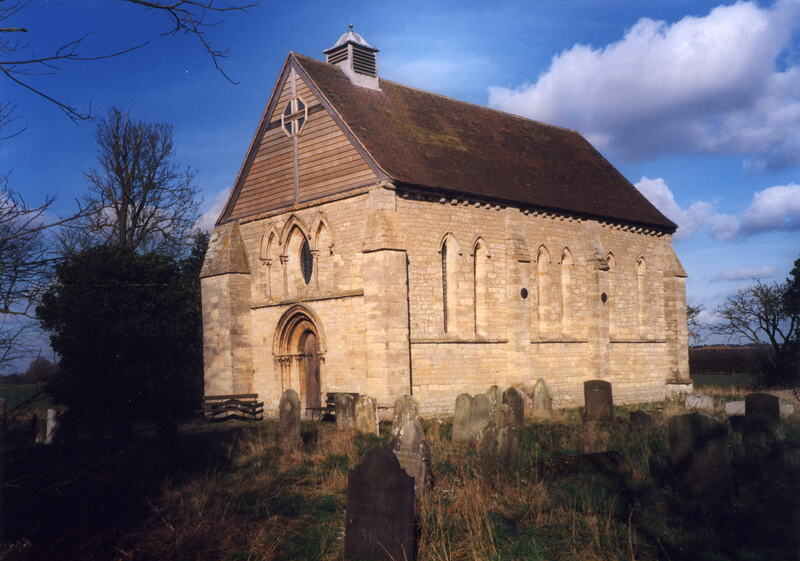 Tours of the village church, St. Leonard's, are held on Saturday and Sunday, 2pm - 5pm by Lincolnshire Heritage. Visit the Fairweather website for more information on the church. There is a photograph of Saint Leonard's Church on the Wendy PARKINSON Church Photos web site. The Anglican parish registers date from 1638. Parish registers are now on file at the Society of Genealogists, covering 1663 - 1799. Kirkstead marriages are in Boyd's Marriage Index, covering 1676 - 1837. I.G.I batch number for christenings, covering 1814 - 1845, is C029621. In 1821 and 1822 a new Presbyterian chapel was built at Kirkstead Wharf in Woodhall parish. It was later used by the Unitarians. For information and assistance in researching see our non-conformist religions page. Visit the Kirkstead Unitarian Chapel, Woodhall Spa web page. Kirkstead is both a village and parish in the vale of the River Witham 122 miles north of London and 7 miles south-west of Horncastle. Woodhall and Martin parishes border to the north, Kirkby on Bain to the east, and Tattershall Thorpe township is to the south. The River Witham flows along the south-west border of the parish. The parish area before 1930 was about 1,550 acres and about 1,440 thereafter. The hamlet of Town End is 1 mile north-east of the church. The village is also in the "AA Road Atlas of Britain 2000", page 33, as being near Woodhall Spa. Richard CROFT has a photograph of Kirkstead Bridge over the River Witham on Geo-graph, taken in December 2005. Ask for a calculation of the distance from Kirkstead to another place. You can see the administrative areas in which Kirkstead has been placed at times in the past. Select one to see a link to a map of that particular area. Kirkstead wasn't a parish at the time of the Norman Conquest. At that time it was a hamlet of Kirkby on Bain. William the Conqueror awarded a manor here to Eudo, one of his knights. Eudo's son, Hugh BRITO (or Hugo BRETON) founded an Cistercian monestary or Abbey here in 1138, dedicated to St. Mary. Monks here complained that the area was swampy and unhealthy. Human bones have been discovered in the Abbey ruins, but none have been identified. Dr. John TAYLOR, author of "The Hebrew Concordance", was minister here from 1715 to 1733. In the early 1800's, as the River Witham was being dredged, six ancient iron candlesticks, presumably from the Abbey, were found. After the dissolution of the monasteries, the Abbey and all lands were surrendered to the King in 1537. The manor passed through several hands and in 1836 it was sold to Thomas MOORE, Esq., of Appleby Hall, Leicestershire. He became owner of all the land in the parish at that time. Kirkstead used to be a station on the Great Northern Railway. Kirskstead is included in the book, "Railways to Skegness" by A.J. LUDLAM, published by Oakwood Press, ISBN 08536 15187, 160 pages, size A5, with over 150 photographs. In St. Leonard's church is an Oak tablet memorial to the five men of World War One from Kirkstead who did not return home. For a photograph of the Kirkstead War Memorial and the list of names on it, see the Roll of Honour site. Kirkstead is from the Old English Cirice+stede for "Site of a Church", presumably because of the Abbey of St. Mary. Shortly after the Abbey was built, the village was called Cristed. The parish was in the south division of the ancient Gartree Wapentake in the East Lindsey district in the parts of Lindsey. In the late 1930's, quite a large portion of Kirkstead was taken into the Woodhall Spa Urban District. The more ancient parish of Kirkstead amalgamated with Woodhall Spa in the early 1980s. This recognized the reality that Kirkstead was the western part of Woodhall Spa between the village centre and the River Witham. Bastardy cases would be heard in the Horncastle petty session hearings at noon, six days a week. Daniel DISNEY funded schooling for the children of Kirkstead in the 1700's, but the children had to attend school in Langton near Horncastle. By 1912, the parish children had moved to a school in Woodhall Spa. No school has been built at Kirkstead.